Jeremy sat in his booster seat, staring at his splayed fingers and kicking the back of daddy’s seat. The peach fuzz on his toddler cheeks glowed luminous in the early evening sun. 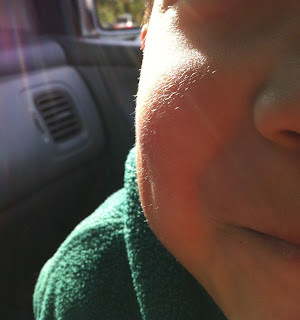 Even through a smudged rear-view mirror, he was heartbreakingly cute. As we pulled into the parking lot, we surmised –as we often do– about what Jeremy might have been like if he didn’t have autism. We agreed he would have been a yapper. He was always talking, singing, happy and playful. We could see glimmers of his personality, behind the veil of autism. He’d always had a remarkable sense of pitch and rhythm when he hummed familiar nursery tunes, despite being unable to follow the words. We daydreamed for a while, letting our imaginations roam to places we usually guard our hearts from. As I became aware of where this was going, I stopped abruptly, “Ok, let’s stop talking about this.” It made me sad to dwell on what could have been. Why torture ourselves? Besides, why talk about our son in the past tense, as if he was dead? We didn’t lose a child. But we grieved the loss of many dreams for him. I stifled a wave of rogue tears and busied myself with Jeremy’s seatbelt. Eddie said nonchalantly, “Well, I’m happy with my boy, just the way he is.” I smiled and nodded silently in agreement.